Summertime! Weeks upon weeks of fun in the sun, right? Maybe for a lot of people…but not for me. Not only do I burn quite easily, but my scar is quite distracting. I know deep down that this scar is nothing compared to what some people have to deal with each day, but to each their own. My scar will not be going away, and when it’s time for that transplant, I will have more scars to go with it. I used to not take my shirt off because I might burn. That’s fair. Then it was because I put on a little weight due to not being as active. Now it’s because I have a lovely scar for people stare at. I was never the kid growing up that cared too much about what others thought. And to a degree, I am still that same person deep down, but this scar changed me. It didn’t change me because of its size, or where it is located. It changed me because of what it represents. A few years ago, my wife and I were in Florida celebrating our anniversary. It was a great trip as it piggy-backed off a work trip that brought me to the same area just days before. A great excuse to get my wife out with me, don’t you agree? We decided on one of the days we were there to go to the beach. I desperately wanted to get my feet into the water and maybe go for a swim. (This was before my activity levels dropped dramatically.) But to do so, I needed to lose the shirt and just get down to the water and do it. The beach was full of people, all shapes and sizes, but I didn’t see anyone else with scars. My wife, who didn’t know at that moment of my anxiety, looked at me funny when she realized I was hesitating on going down. We had found a shady spot towards the top of the beach and it looked like a long walk, at least for me, to get to where the waves were crashing onto the sand. “I don’t want to take my shirt off.” I said in a mumbling voice. “Why not?” With a confused look on her face. I looked her in the eye and told her that everyone will see my scar. It was only then she realized why I was holding off on getting in the water. But after convincing myself it was worth it…I did it. They stared at me. It felt uncomfortable, like I was on display. But I kept walking. I figured as soon as I made it to the water I could get in and cover my scar. The other thing I noticed was that the sun on this very hot day could now hit my scar and that hurt. 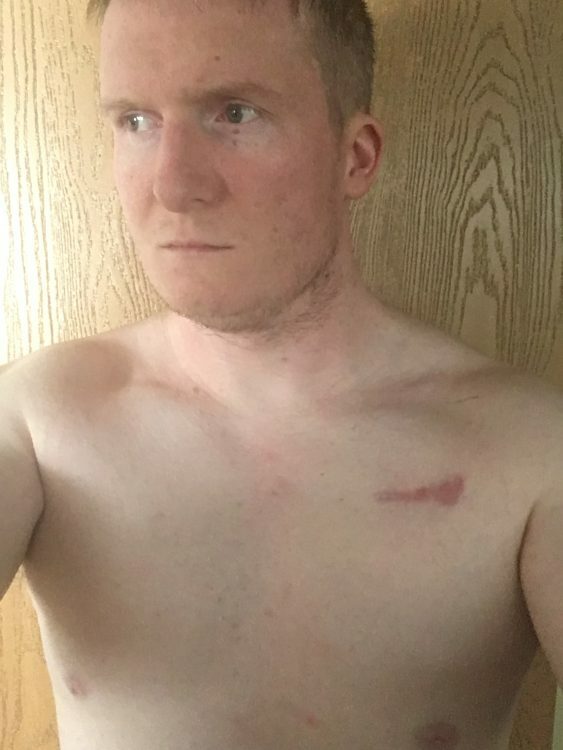 The sun’s rays made my scar feel like it was being torn open. OK, that might be a little dramatic, but it definitely hurt. Jumping forward to today. I don’t want the questions. I’ll talk to you about my scar when I am ready to do so, but until then, I’d like to be treated like a human being. The sad part is, I know it will only get worse. So that’s my story. I don’t like my scar for what it represents. Its placement tells everyone it’s heart-related and then they want answers to questions they don’t know how to ask. So I am going to keep my shirt on this summer – it’s just better that way.